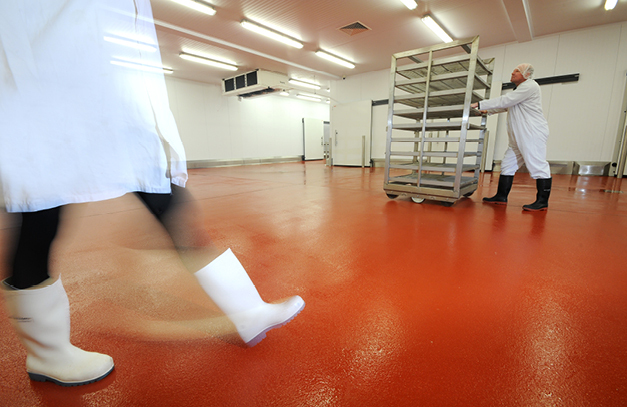 The food production industry represents one of the most technically challenging sectors for floor specification professionals because it strongly depends on the right choice of flooring materials for providing a clean, safe and sanitary environment that meets safety requirements. Vegetable oils, animal fats, dairy products and sugar contain acids that can destroy a typical floor. Furthermore, certain chemicals, food cleaning agents and disinfectants comprising heavy industrial solvents are also included in the process which , if not accounted for, can degrade the floor surface. Food production flooring also receives consistent physical punishment from heavy loads, steel-wheeled carts, dragged crates, etc. so that ultimately, the floor in these facilities needs to be able to survive some of the toughest conditions. Therefor there are several important factors that investors in the food sector, must take into account when choosing a new floor, or planning repair works. Floors in these food production facilities must be able to be thoroughly cleaned, should not absorb fats, nutrients or water, harbour pests or bacteria and should be safely designed to prevent accumulation of water, such as ensuring the floor falls to a drain. All that whilst withstanding high loads. The best product on the market that ticks all these boxes, in the opinion of RCS, and many Facilitiy Managers within the industry is resin flooring. Thermal shock is a regular occurrence in food production facilities for some reasons. They include; blasts of freezing air below -10°F emanating from the refrigerator door, steam cleaning to remove blood stains, grease, and other chemical pollutants, spillage of boiling oil, etc. This immediately changes the temperature which can cause cracks, bubbling, or peeling on the floor. This is a good reason to consider food production flooring with resins carefully. With this well installed, it is less likely to fail when subjected to thermal shock. The chemical occurrence can be described as a decomposition of a floor’s polymer structure so that it can no longer function effectively. 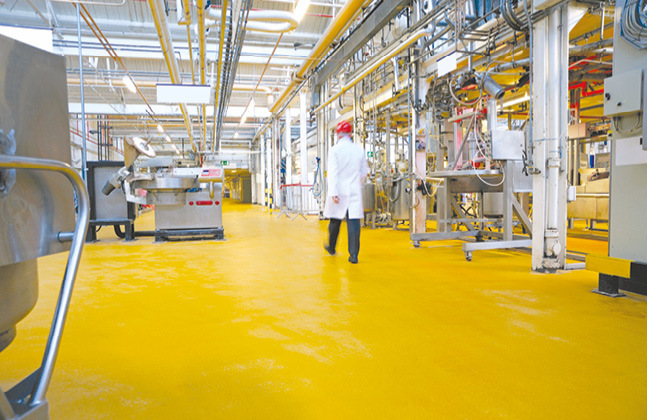 It is, therefore, necessary to ensure that the resin flooring specified in your food production facility can withstand the chemical conditions subjected to the environment. Many factors influence the chemical resistance profile of the resin flooring, including its thickness, the resin composition, and chemical reactivity. The material gives a significantly improved resistance to corrosive materials, food products, solvent, especially an organic acid, when specified and installed correctly. If you’re unsure of the resin to use, please contact us and we can arrange site-visit. Hygiene, health and safety, is paramount for any food production facility. While all industrial zones should be concerned with being as clean and safe as possible, this issue has become crucial for any professional environment where food is prepared, handled chemicals, must avoid the risk of contamination of all products. As such, for a stable and efficient floor that guarantees safe, hygienic environment for your products, resin flooring should be adopted. This surface is required in an environment where people move, have potentially of spreading harmful substances which can be adequately cleaned. As previously mentioned, your food production business requires quality flooring that can last and also maintain high-quality appearance despite the traffic inflow. And I guess, you won’t prefer to spend too much time on maintenance, either. 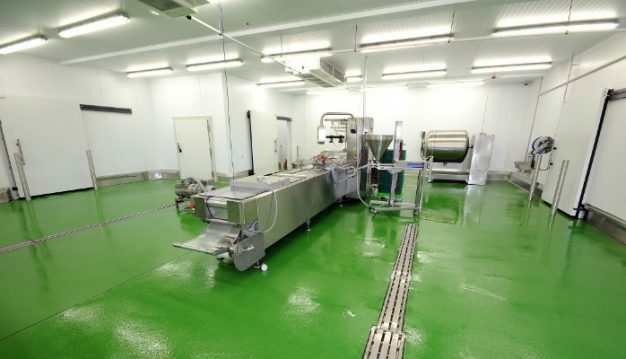 The resin is extremely durable for food production flooring. This means less damage on them, resulting in fewer repairs that would otherwise be very costly for its lifespan. Floors are known for being more abused than any other area in the food production environment because of the chemicals and pushing conditions they are subjected to. Therefore, routine cleaning and efficient maintenance should be in place to preserve the aesthetics and performance of the finished resin. The good thing is that Resin flooring is not affected by of the cleaning materials. The resin floor provides an impermeable barrier which helps to clean the floors efficiently, ensuring that pressure washing does not stain their properties. Food safety is vital for consumer confidence, and the hygienic design of food processing facilities is essential for the production of safe products. The delicate nature of the food processing facilities and risk of contamination demands that food security is factored in the design and construction of the facility during the planning stages. For more information or for a free no-obligation quote please get in touch today.